Artist's impression of two Diluvicursor pickeringi foraging on the bank of a high-energy river within the Australian-Antarctic rift valley. Credit: Peter Trusler. The partial skeleton of a new species of turkey-sized herbivorous dinosaur has been discovered in 113 million year old rocks in southeastern Australia. As reported in open access journal PeerJ, the fossilized tail and foot bones give new insight into the diversity of the small, bipedal herbivorous dinosaurs called ornithopods that roamed the great rift valley that once existed between Australia and Antarctica. 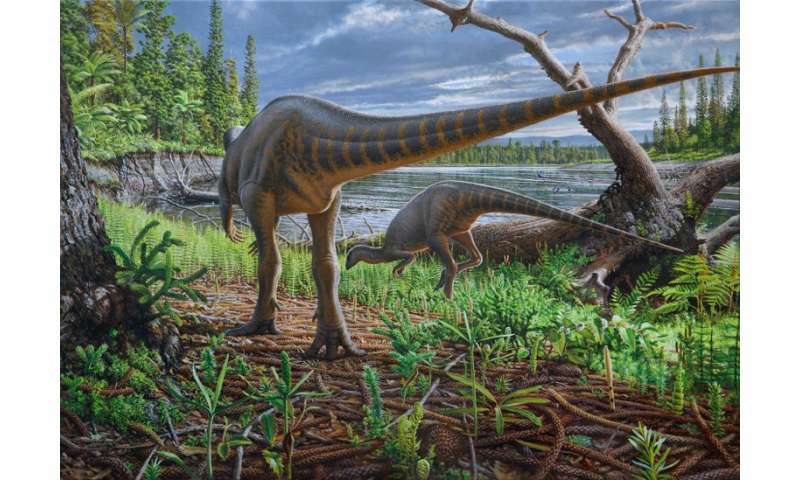 The new dinosaur has been named Diluvicursor pickeringi, which means Pickering's Flood-Running dinosaur. "Diluvicursor shows for the first time that there were at least two distinct body-types among closely related ornithopods in this part of Australia," Dr Matt Herne, lead author of the new study said. "One was lightly built with an extraordinarily long tail, while the other, Diluvicursor, was more solidly built, with a far shorter tail. Our preliminary reconstruction of the tail musculature of Diluvicursor suggests this dinosaur was a good runner, with powerful leg retracting muscles," Dr Herne said. "Understanding the ecology of these dinosaurs—what they ate, how they moved, where they roamed—based on the interplay between anatomy and the environment presents exciting challenges for future research." The species name honors the late David Pickering, who was Museums Victoria's Collection Manager, Vertebrate Palaeontology. 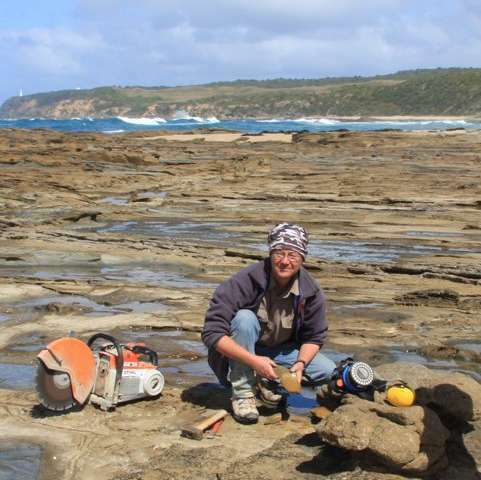 David contributed significantly to Australian paleontology in the lab and field, and tirelessly assisted countless students of paleontology and researchers to achieve their goals. Sadly, David passed away just over a year ago on Christmas Eve 2016. "The carcass of the Diluvicursor pickeringi holotype appears to have become entangled in a log-jam at the bottom of this river," explained Dr Herne. "The sizes of some of the logs in the deposit and the abundance of wood suggest the river traversed a well-forested floodplain. The logs preserved at the site are likely to represent conifer forests of trees within families still seen in Australia today." "Much of the fossil vertebrate material from Eric the Red West has yet to be described, so further dinosaurs and other exciting animals from this site are now anticipated." 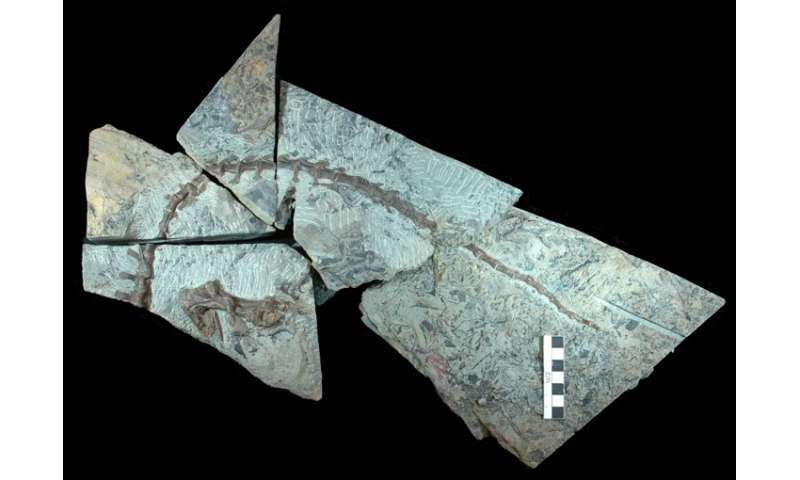 The holotype partial skeleton of Diluvicursor pickeringi after it was prepared from several blocks of sandstone by Lesley Kool of Monash University The fossil preserves most of the tail along with the right ankle and foot. Credit: Steve Poropat and Museums Victoria (CC-BY).